Tiles provide a superior floor, wall or countertop covering. They come in thousands of shapes, sizes and colors for use in many types of projects. The first step in laying tile is choosing a design and arranging the tiles to match. Research the possibilities at your favorite hardware store and buy some tiles. Once you have chosen the tiles, a basic pattern idea and the colored grout, you can begin the task of arranging your tiles and building your own custom pattern. You must lay out and cut your tiles before applying adhesive. Measure the floor and tiles with your tape measure. Sketch your design with a pencil and paper. Make several sketches and choose the one you like best. Lay the tiles on the floor so that they match your sketch. Start in the center of the floor and work your way out towards the walls. Leave a 1/4-inch gap around large tiles and a 1/8-inch gap around small tiles. Cut the tiles as necessary with a wet saw so that the border tiles fit, leaving a gap between the outer edges and the walls. Pick up the tiles in 3 feet by 3 feet sections. Stack the tiles by rows as you lift them from the floor. Use the same stacking method in each section to insure the integrity of the pattern. Stack each group of tiles in its own section. Start in the far corner and work in one section at a time. Spread adhesive with a toothed trowel. Press tiles into the adhesive. Move to the next section only after the previous section is in place. Slide two plastic spacers into the gap on each side of every tile. Lay the level on top of the tiles periodically to insure an even floor. Spread adhesive and lay tiles in every section of the floor. Let the adhesive dry overnight. Remove the plastic spacers. Use your grout bag to fill the gaps between the tiles with colored grout. Let the grout dry overnight. Squirt sealer onto each grout line and let it dry completely. 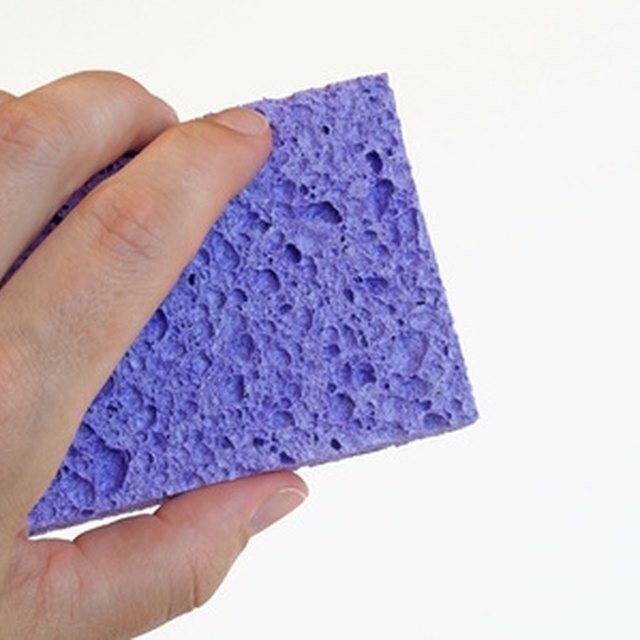 Clean the tiles with a wet sponge. Work gloves and safety glasses are necessary when using hand tools. Hearing protection is required along with your gloves and glasses when using power tools. How Can I Get Rid of Streaks on Ceramic Tile?